Wing span: 7/8 - 15/16 inch (2.2 - 2.4 cm). Identification: No tails. Upperside blue and black; female has more blue than male. Underside turquoise blue; hindwing with 2 irregular bands of small orange spots. Life history: Males perch in treetops to watch for females. Eggs are laid singly on the underside of host plant leaves; caterpillars feed on leaves and fruits. Flight: Two broods in the north and three in the south, from April-September. Caterpillar hosts: Beech (Fagus grandifolia) and beaked hazel (Corylus cornuta). Adult food: Nectar from flowers of fleabane, ox-eyed daisy, and hardtack. Habitat: Deciduous and mixed woods, especially on open ridgetops and along dirt roads. Range: Rare and local in its range. Maritime Provinces west to northern Michigan and northern Wisconsin; south through the Appalachians to Tennessee and North Carolina. 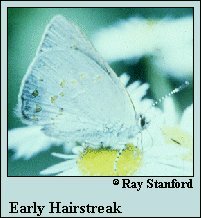 Conservation: All confirmed populations should be conserved. Management needs: Protect habitats and nectar sources.